Donatello        : It's equal mass displacement. See guys, for every one of us that goes, someone from the past will come here. But, the problem is that the switch will only work under one condition. You know what that is? This 1993 release was the third (hence the clever title) in the TMNT series, and instead of just rehashing another turtles vs. Shredder chop-socky storyline, this one opts for that tired old movie chestnut of time travel to spice up the franchise. In this case, turtle pal and reporter April O'Neil comes in possession of a mysterious scepter that magically transports her back to 17th century feudal Japan. Of course, Raphael, Donatello, Michelangelo and Leonardo have to find their way there also, to try and rescue their friend and to do battle with the evil Lord Norinaga (Sab Shimono) and the equally villainous Walker (Stuart Wilson). 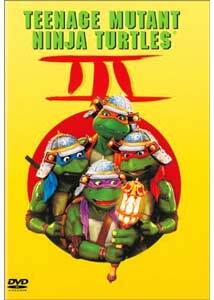 You might call this one Ran for kiddies, as the turtles don ancient ceremonial Japanese battle garb for most of the film. There are plenty of trademark ninja battle sequences, many of them on horseback, so I suppose that qualifies as pushing the creative envelope a bit. The fact that most of the Japanese aren't overly shocked at the human-sized talking turtles in Teenage Mutant Ninja Turtles III indicates the level of just how inherently goofy this sequel really is. Elias Koteas reprises his role of Casey from the first film, the surfer dude, hockey-loving friend of the turtles. Casey supplies most of the modern-day comic relief, as he is left in charge of the four 17th century samurai who were swapped when the turtles went back in time. Hey, don't question the logic, we're talking a magic scepter and "equal mass displacement", ok? He's also is featured as Whit, who is one of the handful of white men living in Lord Norinaga's domain, and of course he crosses goo-goo eyed paths with young April. The time travel angle seems to exist here just to plop the turtles in a fresh environment, and to try and breathe life into the series. The fight scenes are just as comically broad as in the earlier two films, but some of the attempts at high drama (will Michelangelo stay behind?) seem forced and hackneyed, at best. Teenage Mutant Ninja Turtles III is by far the weakest of the three films, but I imagine if you (or your kids) are fans of the boys, there will probably be enough here to hold up the interest level. Image Transfer Review: As with Teenage Mutant Ninja Turtles II, New Line has included a pair of decent transfers: 1.85:1 anamorphic widescreen and 1.33:1 open matte fullframe. This film has many more outdoor sequences, and colors are bright and well-rendered. Black levels,however, show a drastic improvement over those of the second film. The source material contains a few minor print flaws, primarily those always distracting white specks. Audio Transfer Review: I enjoyed the 5.1 Dolby Digital mix that New Line has included here. Though imaging isn't overly pronounced, the rear channels do get a decent workout, which is always a nice touch. This mix isn't as aggressive as on the second film, but it's still full of enough surround cues to expand this film's soundstage. Dialogue is clear, with no trace of hiss or distortion. The 2.0 stereo mix is understandably one-dimensional in comparison. Use this ONLY if you must. Extras Review: Aside from a theatrical trailer for the feature, New Line has included a rather dull matching game called Pick The Flick! This game features stills from a number of "fun-filled New Line family films", and the object is to match the image with a choice of different titles. This is truly for the bored individual with lots of extra time. When I tried to play it, the Dumb & Dumber still came up 7 times is a row. Wow, what a challenge! This isn't Kurosawa, but Teenage Mutant Ninja Turtles III does its best to tackle 17th century feudal Japan with the expected juvenile doses of hijinx and horseplay. The Jim Henson Creature Shop turtle outfits still look quite good, and I will admit that with this film I was finally able to remember which turtle was which.